On the hunt for a new eSports betting site? Founded in 2007, and launched in 2008, this exciting online betting site and casino is the brainchild of three Swedish entrepreneurs whose main aim was to create a web-based gaming experience that was smoother, faster, easier and more enjoyable. Mrgreen.com offers no fewer than 700 games – including Slots, Blackjack, Jackpots – and one of the best eSports betting pages on the web. 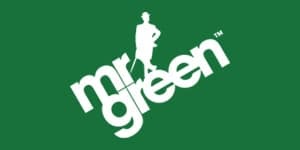 Mr Green’s mascot is a mysterious gentleman – clad in a green suit, hat and umbrella – whose backstory simply describes him as a generous, enigmatic figure who treats his patrons like family. The players who use this site are referred to as the “Green Gamers”. Mr Green is registered in Malta, and its UK operation falls under the licensing and regulation of the UK Gambling Commission. Despite its relatively young age in a highly competitive industry, Mr Green has already won an impressive amount of recognition from its peers, garnering a set of awards, from Online Casino Operator of the Year (International Gaming Awards, 2015) and Mobile Operator of the Year (IGA, 2016) to Socially Responsible Bookmaker of the Year (SBC, 2017), to name a few. For those who may be new to this term, eSports is one of the newest and fastest growing sectors of the gaming industry. Considering the huge popularity of video games which have been around for years, eSports has created a platform for gamers to compete against each other on a global scale. Competitions typically include the most popular video games, though any match involving an opponent and prizes for the winner can qualify. 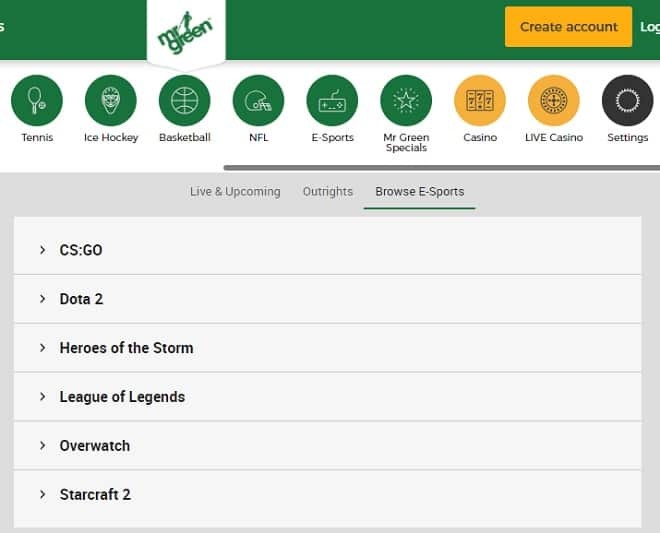 In order to access the variety of available games on which you can place an eSports bet, simply go to mrgreen.com/en/esports. The eSports page on Mr Green is very well designed. 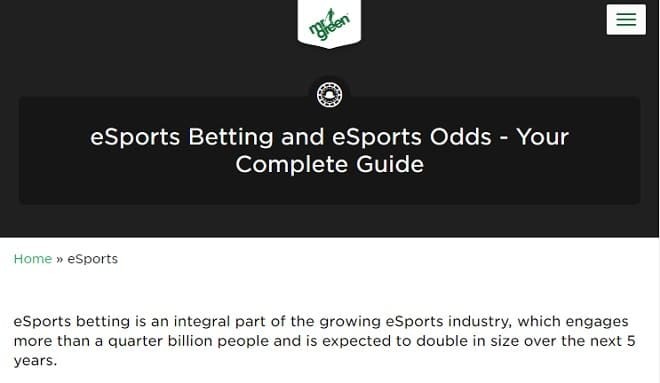 Not only does it carefully lay out a brief presentation of the top eSports games on offer, but it also includes a short history of eSports as a betting challenge, and how and why its popularity has grown over recent years. Additionally, there is a betting tips section which is not only very helpful to those players who are new to the scene, but also serves as an excellent refresher to those who are a bit more experienced. The mrgreen.com eSports page offers some of the most popular games, including League of Legends, Dota 2, Hearthstone and Counter Strike: Global Offensive (CSGO). Each of these games follows a specific type of match, all of which have different rules and certain types of betting odds. Unfortunately, as of now, no markets are available on PlayerUnknown’s Battlegrounds (PUBG) or Overwatch. These two games are just emerging on the eSports scene, and it’s quite likely that they will join Mr Green’s eSports stable in the future. eSports is a vast, complex arena which takes some time for players to get used to. Mr Green offers some handy betting tips, which helps new and experienced gamers alike to hone their strategy by telling them what to look out for. This is very useful, as one downside of eSports is that it may appear overwhelming and confusing at first, particularly to those who are new to the industry and who are unfamiliar with certain games. CS:GO is a different kind of game, known as a first-person shooter. In this case, the teams are divided into ‘terrorists’ and ‘counter-terrorists’, and their goals differ accordingly. When deciding which team to back in CS:GO, it is important to look at which team often comes out on top of what is known as a pistol round. This is where each team chooses what weaponry or armour to purchase, and then the best-prepared team wins the round. At Mr Green it is possible to place bets on the winner of a pistol round. With similar origins to LoL, the gameplay is comparable. The bases to be destroyed are known as Ancients, and the game economy is more complex than LoL. Mr Green recommends considering the underdog team when betting on Dota 2 games. When using Mr Green to place eSports bets, you must first gain access to the sportsbook by creating an account. It is recommended to spend some time getting familiar with the odds, and watching some professional matches on a streaming site such as Twitch. When you feel ready, simply make a deposit and place your bets. 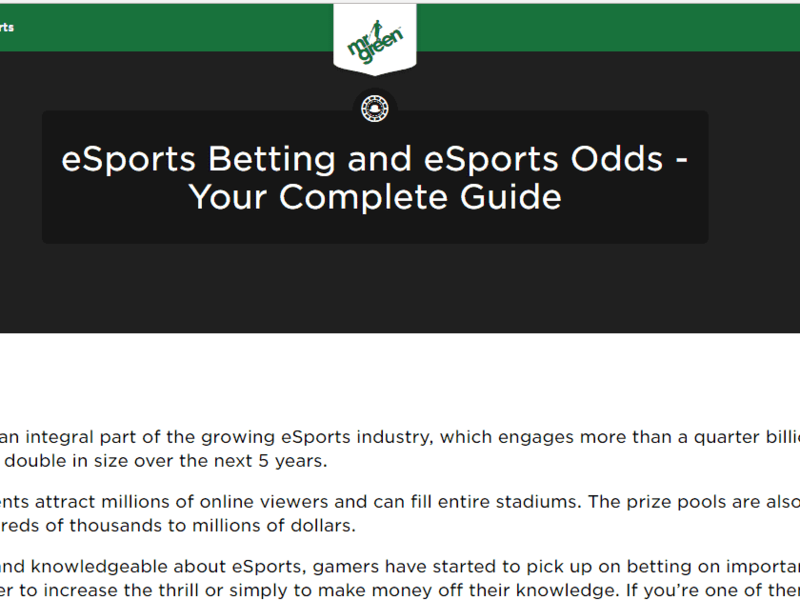 This is just a very brief guide as to how you can place eSports bets. Mr Green has one of the most comprehensive sets of online strategies and betting tips – very few out there can compare. There are several types of odds when it comes to placing an eSports bet, the most common being straight odds (where you predict a match winner or a draw), or outright winner (players are required to choose a winner before a tournament begins, and wait until the game is over to see the results). Then there is also live betting, during which the odds during the ongoing game change according to who has the upper hand. Players are able to see the changes in real time. Bonuses for eSports games are offered on Mr Green’s sportsbook and are a great chance for players to increase their winnings. With League of Legends and Dota 2, a two (!) €10 free bets bonus is offered for a minimum deposit of €20. There is a separate bonus for casino, so new players need to be careful to choose the right one. Unfortunately, no bonus codes are on offer at Mr Green at the moment, and most likely none will be available by the end of the year. Nevertheless, keep an eye out – a bonus code or two may very well pop up in the future. The site is always eager to keep its loyal customers happy and rewarded. Mobile apps for both Android and iPhone users are available to download from the site. Android users will be taken to a page on the site where a full download and installation guide is available. The Android App is optimized for Galaxy S5 and requires OS version 4.1 or later. Mobile betting has never been easier, with these simple and easy-to-use applications available on any mobile device of your choice. iPhone users will be redirected to the iTunes store from where the App can be downloaded directly. A variety of different methods are offered, including debit/credit cards, e-wallets, bank transfer and online top-up cards. Mr Green is partnered with Skrill and Neteller, which both issue debit cards branded by MasterCard, and their other partner, ClickandBuy, offers a similar service. Regarding local bank transfers, Mr Green supports most banks globally and is partnered with Trustly to ensure online safety and security. Most money transfers are made within 24 hours. As far as credit and debit cards are concerned, Visa, Visa Electron, Maestro and MasterCard are accepted. Mr Green also offers a function called Quick Deposit, which allows players to add funds to their account during the middle of a game without having to leave it. Paysafe vouchers are also included. These make it possible for customers to skip over using a checking account whilst being able to change real cash into online funds. They can be bought globally from various stores and suppliers. If you’d like to play using bitcoin, it seems that this option is not available, although it may be in future. Payment methods for withdrawals are the same as deposits. Every seven days each player has one free withdrawal. Withdrawals made between free withdrawal periods will incur fees of €1 for withdrawals up to €100, above which a 1% fee is deducted from the withdrawal amount. Mr Green offers customer service in the form of live chat and email, both of which are open 24/7. Customer service is easily accessed by clicking or tapping the question mark symbol on the top right corner of the screen. This opens a small pop-up screen which is separated into three different tabs: FAQs (which have an instant search function), Live Chat and Support, from where a message can be quickly sent from the site itself simply by including your full name, email address and, if you wish, a phone number.